Most ammonia cooling systems can benefit from a fresh data based approach to operations. A data based decision allows plants to evaluate technologies and operating decisions with full view of the facts allowing systems to become optimized thus taking cost out. Sustainable Water Solutions LLC samples and tests all appropriate waters to uncover all opportunities for savings. Generally savings come via reductions in Electricity, Water, Sewer, & Chemical. Once savings potential is identified the Nereus Pilot System is deployed in order to document / prove savings potential with real operating data from your system. 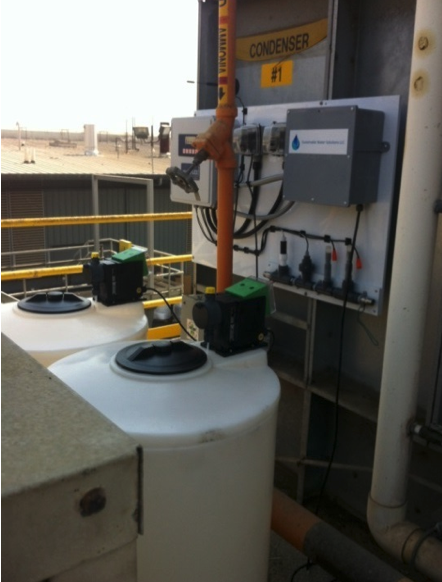 Flow meters are added to make up, bleed and recirculation lines of comperable condenser towers thus allowing the measurement of water use and savings side by side. Temperature is measured in tower water, ammonia refridgerant entering and exiting the condenser, and ambient dry bulb. In addition relative humidity data is gathered. Conductivity, ORP, and pH are measured on line. 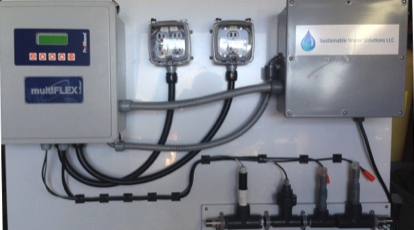 Highly specialized chemical feed pumps are used that proactivly measure amount of chemical added to the system using discharge pressure sensing technology. Alkalinity and Langlier Saturation Index is controlled using Condensafe II a 100% safe synthetic alternative to sulfuric acid. Scaling and biology are controlled using water treatment formlations specifically designed to be effective in the Nereus system. The small amount of chemical that is needed,is loaded into double walled tanks where inventory is measured using ultarsolic level detection technology. All aspects of the system are monitored and controlled. All data is recorded every 5 seconds. Out of spec readings trigger yellow and red state alarms which are sent directly to to those who need to know. Data and calculations are are available for review by users 24/7 via cell phone, I pad, or PC using Nereus wireless capability. A pilot report is produced identifying all savings potentials identified and doccumented. Savings potentials are quantified and should a full scale system be implemented, savings are guranteed to be delivered in writing.